Normally, I’m outside every day in September enjoying the cooler temperatures, brilliant sunshine, and abundant life inspired by the afternoon thunderstorms of the monsoon season. Rain (torrential at times), heavy cloud cover, and temperatures in the low 50s kept me huddled in the house muttering about the imminent arrival of the next Ice Age. As I stared morosely out the window, watching the rain drip from the roof, I began to wonder: What happens to the butterflies, bees, and bugs when the temperatures go from warm and dry to cool and wet in a single day? Thinking this was the perfect subject for a blog (I’m sure you’ve all been dying to know), I donned my rain jacket, grabbed my camera gear, and wandered through the mist to the Fort Davis National Historic Site. Although chiefly known for the 19th century fort buildings, they also have a wonderful nature trail that loops from the fort site, up the ridge that separates the Fort from Davis Mountains State Park, and back down again. Here, I was sure I would find my sleeping bugs. I probably would have, too, if I hadn’t gotten distracted. Every place I peered and poked for insects, I was confronted by ferns. Beautiful, lush, green ferns. The magic of desert rain. Most people don’t hot-foot it to the desert to look for ferns. But perhaps they should. 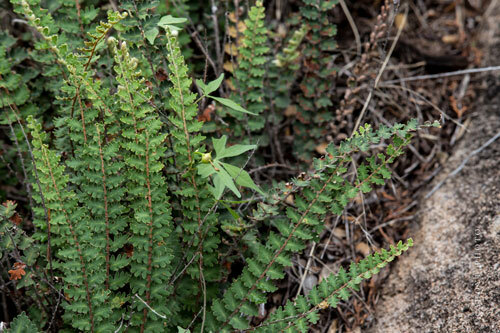 According to botanists Sharon Yarborough and Mike Powell, there are 64 different types of ferns that grow in the Trans-Pecos region of Texas. Ferns can grow in the desert because they’re experts at finding little microhabitats that are just a tinier bit wetter than the surrounding landscape. Look for them growing from cracks in the rock, under the shelter of a tree, or peeking out from beneath a boulder. Depending on when you look, though, you may not be overly impressed. In fact, during most of the year, desert ferns are brown, crispy, and look—well—dead. But fear not! 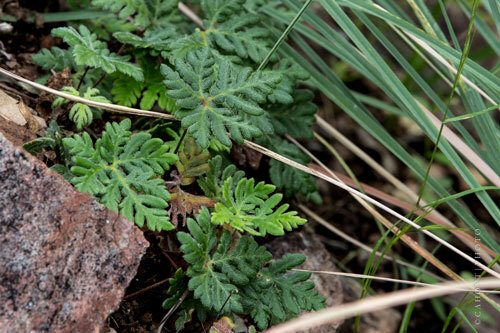 Playing dead is just one of the many adaptations that ferns have for surviving in the desert. And what an adaptation it is. Your average plant can drop to about 75% moisture content before it begins to wilt and beg for water. Creosote, one of our common desert shrubs, can lose about half its moisture before it begins to look a bit peaked. But the ferns. Oh, the ferns. They are the masters of dehydration. During the dry season, some species can desiccate to less than 6%—or as dry as many seeds—but begin to green up, unfurl, and grow within an hour after a refreshing rainfall. When it dries up again, so do the ferns. But ferns don’t give up their moisture easily. They may be able to survive as a brittle frond, but life is better when you’re green and photosynthesizing. So to stay green as long as possible, the ferns (and many other desert plants) have ways to reduce moisture loss. Small is better. 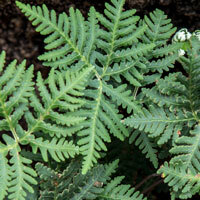 Most desert ferns are much smaller then their rainforest cousins. Remember that during the process of photosynthesis the plant takes in carbon dioxide and releases oxygen and water as a waste product. The smaller the leaf, the less water is released. Be waxy. Most water is lost (transpired) from special cells on the leaf called stomata. These open and close to absorb and release gases (carbon dioxide, oxygen, and water). But other parts of the leaf surface and stem can lose water through simple evaporation. To help protect from this “incidental” water loss, many of the ferns have a cuticle of waxy deposits on the leave surface that make them thicker and seal in the water. Get hairy. 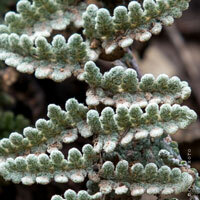 Have you noticed how many ferns are grey and fuzzy? If you look closely, you’ll notice that the color is due to a dense coating of hair. These light-colored hairs serve a couple of purposes. First they reflect light making the leaf surface temperature cooler and they efficiently trap rain, dew, and other forms of moisture to raise the humidity around the leaf surface. Keeping the air surface immediately around the leaf cooler and more humid reduces the evaporative demand from the atmosphere. Thick leaf margins. The last defense against moisture loss is the ability of the leaflets to roll, thus protecting the surface and the spores. Many fern leaflets have thickened margins that enhance the ability of the leaf to roll. Not all ferns found in the desert have these adaptations for dry conditions, though. Others simply seek places where there is enough moisture. 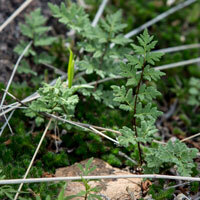 Delicate maidenhair ferns, for example, can be found on many shaded rock faces with perennial seep springs. You can find these beautiful ferns at the bottom of Modesta Canyon at the Chihuahuan Desert Nature Center or in the grotto at Ojito Adentro, Big Bend Ranch State Park. 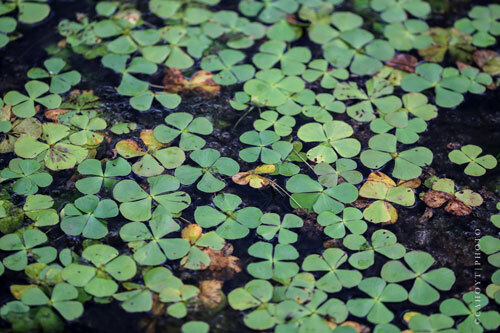 But my favorite fern is the water clover. 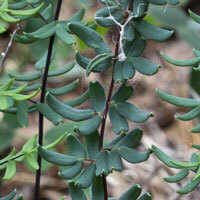 This aquatic fern survives the dry season as a packet of spores (sporocarp) in the mud of ephemeral pools. When the rainy season arrives and the pools fill with water, the gelatinous interior of the sporocarp swells, rises to the water surface and splits, releasing the male and female spores. Once they do what males and females do, the newly fertilized embryo sinks to the bottom of the pool, takes root and begins to grow, eventually spreading its four leaflets across the surface of the pool to begin the cycle of life again. It’s starting to rain. Time to go look for ferns! This entry was posted in Chihuahuan Desert, Plants and tagged Big Bend Ranch State Park, Chihuahuan Desert Nature Center, Ferns, Fort Davis National Historic Site, Texas. Never thought I would say, “Huh, how interesting!” out loud when reading an article about ferns, but I certainly did.